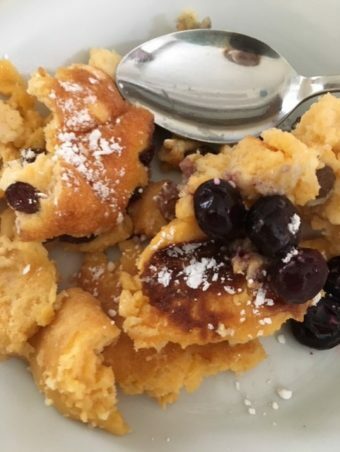 Kaiserschmarrn is a pancake with a difference. It’s a traditional Austrian and Bavarian dessert served in most cafes and mountain huts (Almhütten). It originated as a favourite dish of the Emperor (Kaiser) Franz Josef I of Austria, who lived in Vienna about 100 years ago. 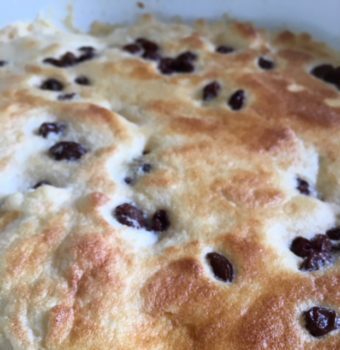 It’s a thick scrambled pancake with raisins, which is lightly caramelized and eaten with either plum sauce, stewed fruit or berries. My post about the language of Austrian cuisine includes a photo of a more elaborate version with lots of fresh fruit. Anytime! 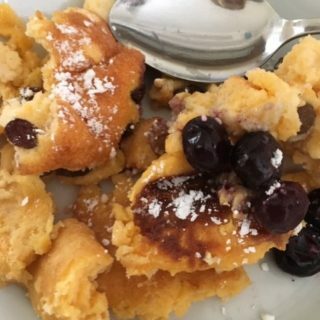 We made yummy Kaiserschmarrn at home one weekend and ate it for breakfast. It’s a comfort food for January – more ideas for winter comfort are in my blog post on the Danish Hygge. No point in waiting for Pancake Day – Easter is so late this year that you’ll have to wait until March 5th for Shrove Tuesday! The French don’t wait so long for their annual pancake tradition. They make pancakes to celebrate “Chandeleur” (Candelmas) on February 2nd, a fixed Catholic holy day 40 days after Christmas. 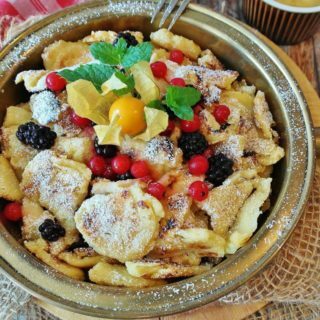 You could eat Kaiserschmarrn for breakfast or as a dessert, but many Austrians and Bavarians don’t leave it for dessert – they eat it as their main course when they go to a café for lunch, even though it’s a sweet dish. It’s very filling, but after a long hike in the mountains they have plenty of room for it. 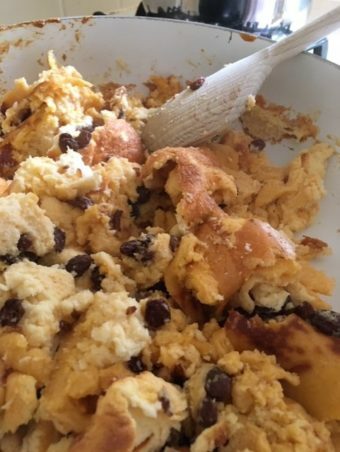 We could translate Kaiserschmarrn as “Emperor’s Mish Mash” or “Emperor’s scrambled pancake”, but I prefer to keep its original name. “Schmarrn” can also mean “nonsense”in Austrian German, which explains why I’ve seen Kaiserschmarrn mit Apfelmus” advertised as “Emperor’s nonsens with apple mush” as well as “Emperor’s Mess”. You have to be careful with a dictionary. 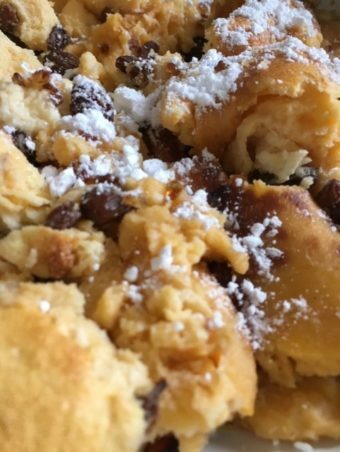 Franz Josef used to enjoy a plateful of Kaiserschmarrn after a walk in his palace grounds at Schoenbrunn just outside Vienna. There are a few stories about how he was introduced to this sweet treat. According to one story, his fitness-conscious wife, the Empress Elisabeth, once asked her cooks to prepare a light desert for the couple. The Kaiserschmarrn they produced was still too rich for her so the Emperor ate her portion as well as his own. Another story claims that the Emperor was visiting a village and the locals couldn’t think of a dish to offer him at short notice, so they decided to make him a pancake. They messed it up (made a “pig’s ear” of it) but he still wolfed it down. 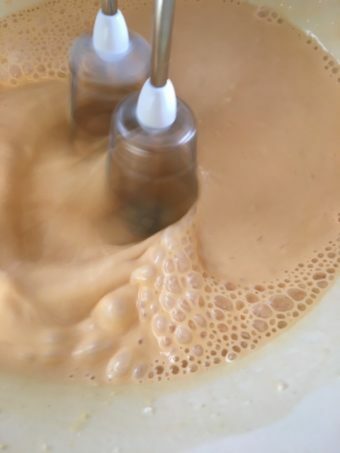 I’ve included photos of some of the steps in the recipe, to give you a guide as to how the mixture should look at various stages and to show off the scrummy textures. Das Wasser läuft mir im Mund zusammen! Literally, the water runs to me in the mouth together. 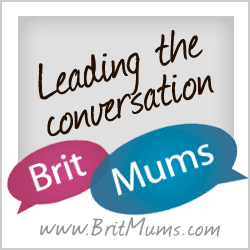 German learners – spot the German verbs! In recipes they’re always in the infinitive, and therefore placed at the end of the sentence or clause. Recipes are about actions, so if you follow recipes in a language you’re learning, you’ll learn lots of new verbs while you cook delicious new things. 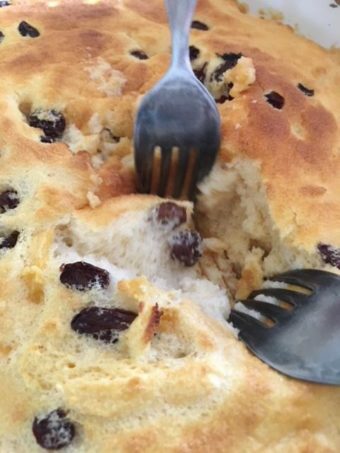 NB: talking of actions, this is a “torn” pancake, so you won’t get the risk/fun of tossing it or watching someone else tossing it – and it landing somewhere which is not your plate. First of all, separate the eggs: whites in one large bowl, yolks in another large bowl. Zuerst die Eier trennen: Eiklar (lit. “egg clear”) in einer grossen Schale, Eigelb (“egg yellow”) in einer anderen grossen Schale. 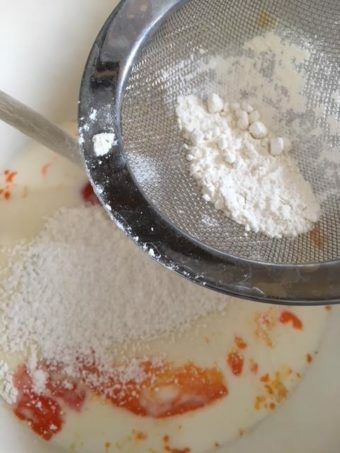 Mix the yolks with the lemon rind, sugar and vanilla. 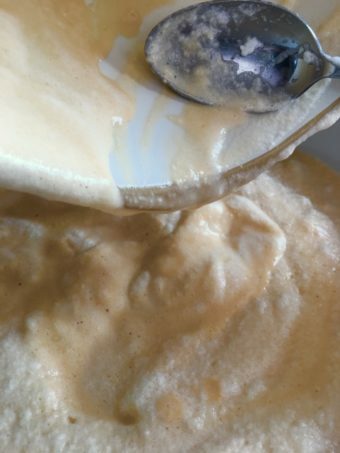 Eigelb mit Zitronenschale, Zucker und Vanille mischen. 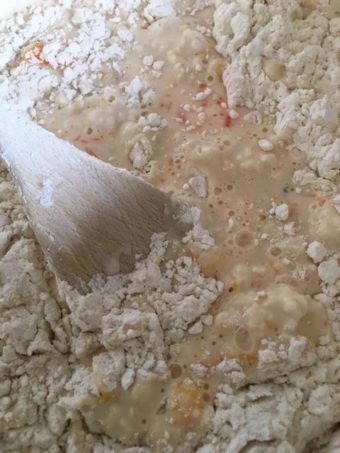 Gradually add the milk and sieve in the flour. Nach und nach die Milch zugeben und das Mehl einsieben. 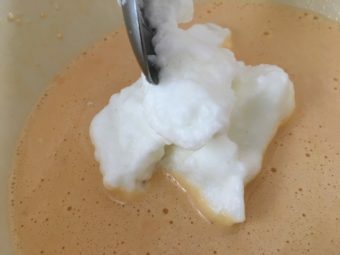 Whisk the mixture until fluffy. 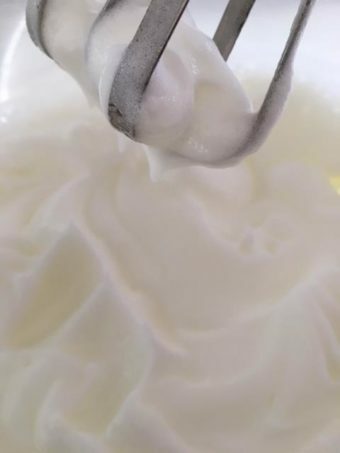 Rinse and dry the whisk. Den Schneebesen (lit.“snow broom”!) abspülen und trocknen. 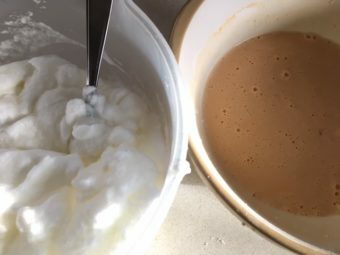 Whisk the egg whites with the salt in the other bowl. Eiklar und Salz in der anderen Schale steif schlagen. 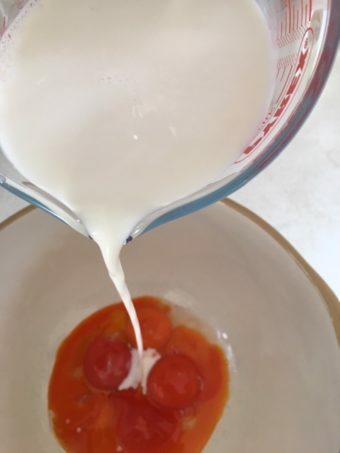 Carefully fold the egg whites into the egg yolk mixture. Das Eiklar vorsichtig in die Eiklarmischung unterschlagen. Die Butter in einer Bratpfanne zerlassen. Die Mischung in die Bratpfanne eingiessen. 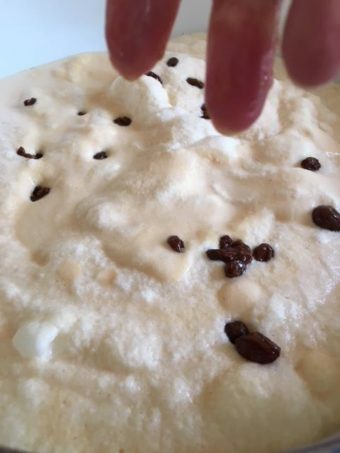 Drain the raisins and sprinkle them onto the mixture. Die Rosinen ablaufen lassen und in die Mischung streuen. Fry the mixture until it is set. Die Mischung in der Pfanne braten, bis sie fest ist. Tear the Schmarrn into pieces using two forks. Den Pfannkuchen mit zwei Gabeln in Stücke zerreissen. Stir the pieces around and turn them over. Die Stücke herumrühren und umdrehen. Sprinkle the butter shavings and the crystallized sugar onto the Schmarrn. Die Butterstückchen und den Kristallzucker auf den Schmarrn streuen. Stir the Schmarrn again, to lightly caramelize it. 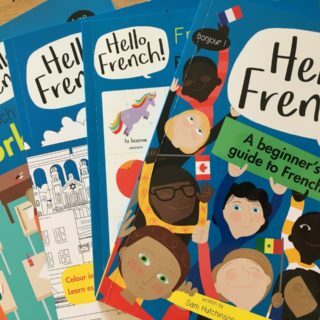 Den Schmarrn wieder rühren, um ihn leicht zu karamellisieren (The verb “rühren” is a great opportunity to practise the German “ü” sandwiched between two “r”s – even more challenging for British learners than the noun “Frühstück”). Pile the Schmarrn onto plates. Den Schmarrn auf Teller häufen. Dust with icing sugar and cinnamon. Mit Puderzucker und Zimt bestäuben. Serve the finished Kaiserschmarrn with stewed apple, berries or fruit compote. 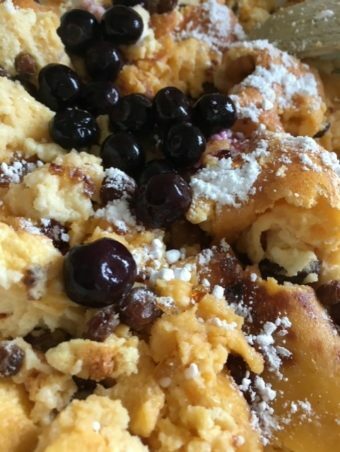 Den fertigen Kaiserschmarrn mit Apfelmus, Beeren oder Kompott servieren. « The language of Austrian cuisine – what’s on your menu?